Marsh Dewflower is an erect or nearly erect, branched herb; fibrous roots often tuberous, slightly thickened; stem angular, hairless or hairy. Leaves are 3-6 x 0.4-0.8 cm, stem, alternate, oblong-lanceshaped or lanceshaped, margin wavy, tip pointed or shortly tapering, base rounded, more or less stem-claspinge, prominently striped, hairy; sheath 8-12 mm long, hairy. Flowers are 5-6 mm long, 1-2, orange-yellow, in leaf-axils to the upper leaf-sheaths; flower-stalks 2-4 cm long, erect or slightly bent in fruits, jointed at middle, hairy below the joints; bracteoles 2 at joints, about 1 mm long, membranous, ovate, blunt. Sepals 3, free, slightly unequal, about 6 x 2 mm, elliptic-oblong, subpointed, straw-coloured, persistent. Petals 3, free, orange-yellow, bluish when dry, obovate, slightly longer than sepals. Fertile stamens are 3; filaments bearded; anthers 2-celled; staminodes 3. Capsule 5-7 mm long, oblong, trigonous, cuspidate with persistent style, 3-celled; seeds 3 or more, angular, pitted. 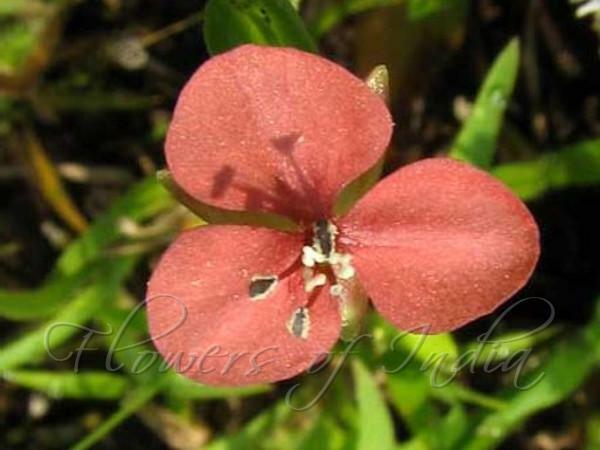 Marsh Dewflower is found in Peninsular India. Flowering: October-November. Identification credit: Vinay R. Kolte, Navendu Pagé Photographed in Karnataka.